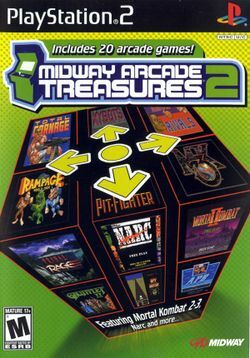 Midway Arcade Treasures 2 is the second collection of classic arcade games published by Midway for the GameCube, PlayStation 2, and Xbox. This compilation includes 20 games that were not in the 2003 release of Midway Arcade Treasures or the 2005 release of Midway Arcade Treasures 3. The game plays similarly on all three consoles, however the Xbox version has the exclusive ability to upload scores to an online scoreboard. The special features on each version of game are the same. These include game histories, developer interviews, and other documents. This collection was given an "M"-rating largely because of Mortal Kombat II and 3, Primal Rage, and NARC. With all the other games, the compilation would have received a rating of a "T" (for teen) or lower. Rampage World Tour is also featured as a bonus game in Rampage Total Destruction on GameCube and Wii, which is rated "E10+". The compilation was planned to include all three Mortal Kombat titles, Steel Talons and S.T.U.N. Runner. The first Mortal Kombat game was moved to the extras disc in the limited edition version of Mortal Kombat: Deception, while the other two games were omitted entirely because of developmental problems. Kozmik Krooz'r and Wacko were added instead. The first Mortal Kombat later appeared in other compilations from the Midway Arcade Treasures series: Extended Play for the PSP, and Deluxe Edition for the PC; while S.T.U.N. Runner appeared in Midway Arcade Treasures 3. This page was last edited on 7 September 2009, at 22:14.